For better or worse Vorege ( Call me Frank)Bainimarama is locked in an unbreakable embrace with the man he has handed over control of our nation to; Aiyaz Sayed – Khaiyum. Sink or swim, for better or worse, this marriage made in hell could destroy all Franks hopes, ambition and unfortunately most of the good he has achieved over the past 7 years, regardless of the fact our children’s children will have to pay the monetary debts he and his henchman have incurred. Frank thinks he and his second First Party have as good as won the election, he may soon be very disappointed. There are a great many voters who can see Aiyaz Sayed – Khaiyum for what he really is, and they do not like what they see. 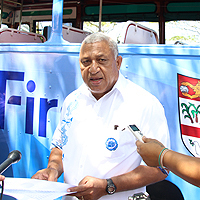 They do not want Aiyaz Sayed – Khaiyum to run Fiji for another four or more years. We only have a few weeks to wait to see exactly how many.